Mari Miniatt: Two creatures to consider. I came across two creatures, actually one creature and one group of creatures that could and should be used more in horror, or fantasy fiction. Not a werewolf. A weredog. A weredog is like a werewolf, but have been domesticated. Now I know of at least one writer that would argue that most werewolves in fiction are actually weredogs. I tend to agree. Most writers do not have access to wolves. The only canine we interact with are dogs. So it is easy to think that they are the same. But that is like saying your cat, Fluffy is just like the lion in Africa. How to tell if you have a weredog? They are very obedient, if the "master" has been kind to them. They will look for a "master"
Have some of the traits of a dog in human form. Drooling when good food is near, begging. They can be vicious, but will need a reason to act out. Such as "master" is attacked, they are told to attack. It's different. People would expect a werewolf, and then there would be this creature that could be controlled by a "master". If you don't think that is scary, what if you had a group of them acting like junk yard dogs? The second are the Shadow People. These are not exactly ghosts. Maybe they could be a trick of the light, but they can be very scary. They appear as humanoid shadows. Sometimes wearing a hat. They appear in well lighted rooms, half lighted rooms, but not always out of the corner of you eye. Why are they scary? 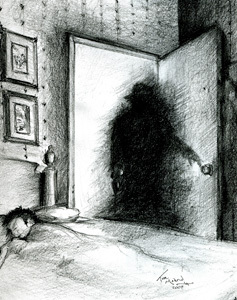 Most people that say they have seen them, talk about a presence around the shadow. Not evil, but oppressive. I had a friend that had a small group appear to him in his room one night. He sat up in bed (In this case, no sleep paralysis) and watch the group gather around the foot of his bed. They stood there, and did nothing but stand there. He turned on the light, and they were still there. Just not as pronounced. The shadow people completely freaked me out.